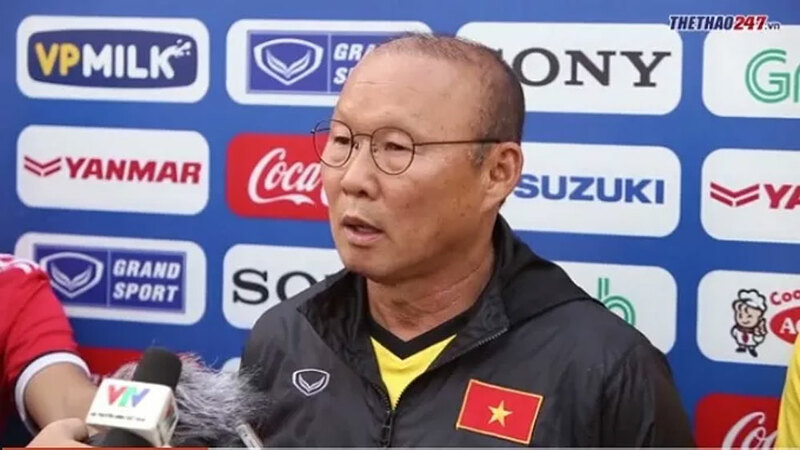 Every member of the Vietnamese team will try their best in each match and are now ready to repeat the 2008 miracle, head coach Park Hang-seo told reporters during their last training session in Hanoi on November 4, before heading to Laos for the Group A opener, scheduled in three days’ time. In preparation for the AFF Championship, Park’s side underwent nearly one month of training and recently concluded a two-week training course in the Republic of Korea (RoK). Vietnam coach Park Hang-seo grants the local media an interview on November 4. With the success achieved while leading Vietnam’s U23 and Olympic teams, Park Hang-seo is expected to go on to help Vietnamese football realize its dream of lifting the AFF Cup trophy for the second time after ten years of waiting. Speaking with the local media on Sunday, the 59-year-old tactician said there is a big difference between the youth and national team levels, but affirmed that this is also a motivation for his players to exert greater efforts during the preparation process for the biennial tournament. “I am very happy as the team has played well over recent times. But you should be aware that it is quite different at the national team level. I know that and have made the best possible preparations. At present, our players are in good mood with solidarity and will work together to achieve the big goal,” Park said. Vietnamese players in action during their last training session on Sunday. He affirmed that the Vietnamese team will challenge the top honor at the upcoming AFF Suzuki Cup. “Each match will be like a final to us. We will try our best in each game,” he stated. At the 2018 AFF Championship, Vietnam have been placed in Group A, together with Malaysia, Myanmar, Cambodia and Laos. The “yellow stars” will play the group opener against Laos on November 8 before taking on Malaysia, Myanmar and Cambodia on November 16, 20 and 24, respectively. Coach Park Hang-Seo and Vietnam national football team squad are on training at the Paju football centre in the Republic of Korea (ROK) to prepare for the upcoming ASEAN Football Federation Championship - Suzuki Cup 2018.